Five people have been trampled to death in Tehran following a football World Cup qualifying match between Iran and Japan, state news agency Irna reported. About 40 others were hurt as more than 100,000 spectators at the Azadi stadium moved to the exits after the game, doctors told the agency. At least five of the injured were in a critical condition, the report said. Police, judicial and football officials were investigating the incident that followed Iran's 2-1 win, Irna said. The injured people have been admitted to three hospitals, Tehran's emergency centre officials were quoted as saying. All of the casualties were believed to be Iranians. No reason was given for the rush to the doors. 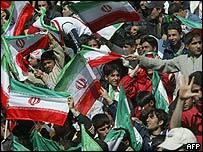 Irna also said that 86 buses were damaged in crowd violence after the match, although no arrests were reported. Iran's victory in the Group B World Cup qualifying match leaves them top of the group.